Happy Jewish Genealogy Month! Recognized annually since 1999, Jewish Genealogy Month is now held during the Hebrew month of Cheshvan. This year, Cheshvan corresponds to October 29 through November 26. Whether or not you or your ancestors are Jewish, this month is a great time to celebrate and learn more about Jewish history. You can start by reading our Expert Series articles on topics specifically related to Jewish genealogy. �	Robert J. Friedman's overview of Jewish genealogy offers insight to starting your research and outlines how names may have changed as they were translated from Hebrew into other languages. �	Rose Cohen's introduction to archives in Israel walks readers through "The Case Of The Chalomovsky Family," showcasing Israeli archival resources along the way. �	Lisa Alzo's article on tracing family history in Eastern Europe offers a wealth of information about resources in the United States and in Europe. �	This list of websites and organizations helpful in tracing Jewish family history also includes information about regional Jewish genealogical societies. During Jewish Genealogical Month, many of these regional organizations will be holding special workshops and events. Regardless of whether there is a dedicated event in your town, you can get involved and contribute to Jewish genealogy. As with family history in general, digitization has made many records more accessible. In June, Archives awarded a grant to the Jewish Genealogical Society of Washington State to digitize the Jewish Transcript (now called JT News), a Seattle-based newspaper that has published vital records, like birth, marriage, and death announcements, Bar and Bat Mitzvah information, and a record of historical and community events, for the past 120 years. Of course, there is still a long way to go with digitization, as many records remain accessible only offline and in the original language. For example, Yizkor books are very valuable resources for anyone interested in Central or Eastern European history. These memorial books, written collaboratively by former members of communities devastated by the Holocaust, pay tribute to families and neighbors who were killed, as well as the place they used to live. Many Yizkor books were written in Yiddish or Hebrew, and have not yet been translated into English. 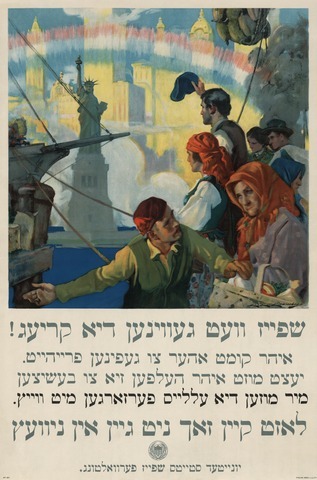 Even if you don't read Hebrew or Yiddish, you can help with the important task of translating these rich genealogical resources. Through JewishGen, you can get involved in a variety of online volunteer opportunities, such as coordinating translations of Yizkor books from Hebrew or Yiddish into English, donating already translated materials, or creating webpages to commemorate Jewish communities throughout history. We hope all family historians take some time this month to explore Jewish genealogy. Have you used any of these resources or helped transcribe Jewish genealogical records? Tell us about your experience in the comments below!